Amid a visa crisis with the US over the arrest of a Turkish national working at the İstanbul Consulate General last week, the wife and child of another US Consulate staff member for whom Turkish authorities issued a detention warrant on Sunday morning were detained in Amasya over links to the Gülen group, which the Turkish government accuses of being behind a failed coup last year. According to a Hürriyet daily story on Monday, US Consulate employee N.M.C.’s wife S.C. and his child K.İ.C. were detained in the Merzifon district of Amasya province as part of an investigation into Gülen movement members while N.M.C. has remained in the consulate building in İstanbul. The İstanbul Chief Public Prosecutor’s Office issued a detention warrant for N.M.C., who works in a consulate department handling issues with Turkish law enforcement. The police were unable to detain him because he has remained in the consulate building. According to the report, his wife opened a bank account at Bank Asya, which was seized in 2015 by the Turkish government over links to the Gülen movement after President Recep Tayyip Erdoğan publicly targeted it. Earlier on Monday, Turkish Justice Minister Abdulhamit Gül said he was not aware of a decision for the detention or arrest of a second US Consulate employee. İstanbul Consulate General staff member Metin Topuz was arrested late on Oct. 4 on espionage charges and alleged links to some leading members of the Gülen movement. Speaking to a group of journalists in İstanbul on Friday, John Bass, the departing US ambassador to Turkey, said some in the Turkish government are motivated by “vengeance rather than justice,” voicing concern at coverage in pro-government media outlets of the arrest of Topuz. 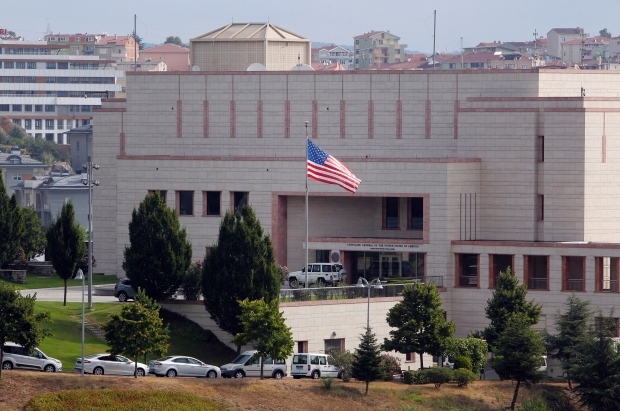 The US Embassy in Ankara on Sunday announced that it had suspended all non-immigrant visa services at its diplomatic facilities in Turkey. Hours after the release of the statement, the Turkish Embassy in Washington announced that it had suspended all non-immigrant visa services at all Turkish diplomatic missions in the US. The Turkish Embassy in Washington retaliated by copying and reversing the US statement. “This measure will apply to visas in passports as well as e-Visas and visas acquired at the border,” the Turkish Embassy added in its statement.